Easily one of the most influential record labels in all of Music City, as well as a taste maker in the garage psych/punk/metal/rock movement nationally and beyond, Infinity Cat Recordings holds a very near and dear place in our collective hearts here at No Country. You can bet pretty much every artist on their growing roster (see JEFF the Brotherhood, Diarrhea Planet, Daddy Issues, etc.) will get plenty of coverage from us, because the label has earned a reputation for only putting out quality stuff that always keeps their legion of die-hard fans happy. 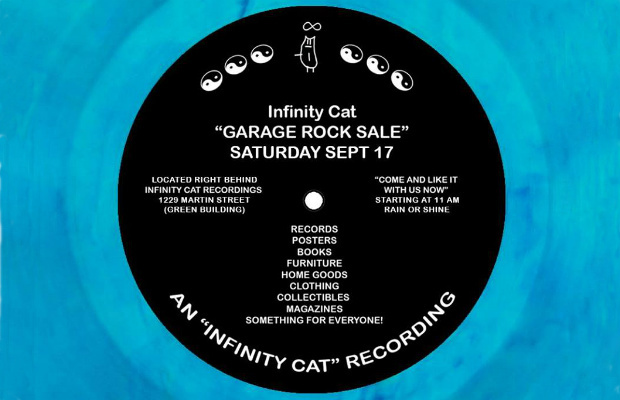 With all this in mind, we thought it was important to make special mention their one-time, Garage Rock Sale will be running Saturday (9/17) from 11 am – 4 pm at 1229 Martin St, which is located in the green building behind their soon to be former Infinity Cat House Visitor’s Center. In an effort to purge before moving to a new location, IC will be selling CDs, vinyl, cassettes, art, posters, clothes, instruments, furniture and home goods, books/magazines, collectibles of all shapes and sizes, and misc items from IC roster members and staff. There will also be a “DOLLARAMA” section, where everything is only $1. Head on over, get some goodies, and help lighten the load for the beloved local label, as they move to a new space. Pragmatic optimist. Music nerd. Closet hippie. Let’s get weird with it. Oh snap. Gonna have to tell my dad to head over there for me to see if any Diarrhea Planet posters are available.